Jonathan Newell reviews Cherwell Laboratories’ pharmaceutical cleanroom decontamination guide. As manufacturing cleanrooms face increasingly stringent contamination control requirements, different types of contaminants are coming into play. Healthcare and pharmaceutical labs have always had to face the issue of maintaining sterile environments as well as keeping particle counts down although this may be a new arena for cleanroom specialists involved in other industries. To help engineers and scientists find out more about keeping cleanrooms sterile, Cherwell Laboratories has published its “The pharmaceutical lab’s pocket guide to cleanroom decontamination”. Originally, manufacturing cleanrooms were developed to specifications to reduce the size and quantity of airborne particles. Once clean airflow has been established and maintained, surface contamination can also be maintained at acceptable levels. To determine the level of contamination and provide specifications for contamination free thresholds, ISO 14644-1 makes provisions for 9 classes of cleanroom with ISO 9 being the “dirtiest” and ISO 1 being the level with the smallest particle size and the least number of them in a given volume of air. All of this will be old hat to experienced cleanroom operators and engineers but there’s more to contamination than particles. Chemical contaminants can corrode or degrade components, magnetic contamination can destroy computer disk drives at the manufacturing stage and even vibration can be considered a contaminant in nano-manufacturing environments. However, the big threat in the pharmaceutical and healthcare industries is biological contamination. Cleanrooms in these industries need to meet stringent particulate contamination control standards as well as being sterile to prevent biological contamination. Bicester based Cherwell Laboratories is a specialist in environmental monitoring, cleanroom bio-decontamination and process validation for healthcare, pharmaceutical and industrial cleanroom operators. The company recently released its guide to cleanroom decontamination for personnel in these industries. Cleanroom validation for Pharmaceutical industry manufacturers involves two stages of meeting the required standards initially and then maintaining them throughout the operation of the cleanroom. Two standards are applicable in the Pharma industry. ISO 14644-1 covers particulates with ISO 14644-2 covering the schedule for monitoring for continued compliance. ISO 14698 (parts 1 and 2) covers biocontamination control. There are other regulations which cover the materials and equipment used for decontamination work. For maintaining bio-cleanliness, Cherwell Laboratories recommends following the EU European Medicines Agency – Good Manufacturing Practice (GMP) in conjunction with the ISO standard. Cherwell details two levels of cleaning up biological contamination including routing maintenance operations and remedial decontamination after a filter failure, a shut down or what it terms a “bioburden outbreak”. This term refers to the condition of having biological contamination that exceeds the microbial limit as defined in the standard and is normally discovered during routine maintenance testing to assure continued conformance to the standards. According to Cherwell, the routine maintenance decontamination is best performed using a range of disinfectant products backed up by reserve measures that can be deployed if any resistance to normal cleaning products is encountered. 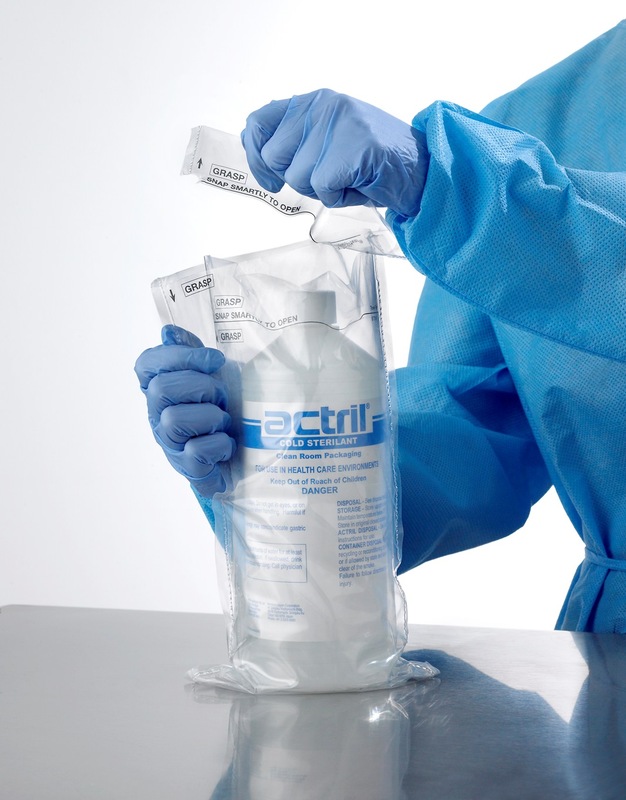 Remedial decontamination can be done manually with sterilizing wipes and other cleaning products or semi-automatically using fogging systems when the cleanroom is empty and sealed. Choosing the right disinfectant to use can be complex and depends on many factors. The decontamination guide gives a comprehensive guide to the different types of disinfectant and the applications for which they’re best suited. For routine decontamination, the guide splits the types of disinfectants into oxidising, non-oxidising and hand sanitisers. Each type works in a different way and uses a different mode of attack on the contamination that needs to be removed so the choice of which to use must be based on full knowledge of what is most effective. Generally, the guide indicates that oxidising disinfectants for use in pharma environments have a broader range of activities than non-oxidising variants. Hand sanitisers are usually alcohol based and rely on correct method of usage for them to be effective. For setting up a maintenance procedure for pharmaceutical cleanrooms using surface disinfectants, there are a number of other factors to consider than whether it should be oxidising or non-oxidising. Choices of product can come down to cost, health considerations, surface types to be cleaned and whether they are ready-to-use or require mixing before application, which takes additional time. Cleanroom operators and cleaning staff should have access to the full range of cleaning products that are required with clear procedures showing which product to use and how it should be applied for specific use cases. Procedural ambiguity very easily leads to mistakes being made and subsequent bioburden outbreaks the could easily be avoided and which result in expensive remedial decontamination. * Contact time should typically be low to enable the disinfectant to work rapidly to allow the cleanroom to continue operations. * Operator exposure should be minimised or eliminated when using oxidising sporicidal disinfectants. * Compatibility with other cleaning products that may have been used to remove dirt before disinfecting. * Surface material compatibility is important to avoid discolouration, corrosion, abrasion or tarnishing. Providing cleanroom personnel with an overview of decontamination technology, the Cherwell Laboratories guide aims to help operators to understand the complex protocols and heavily regulated procedures associated with pharmaceutical cleanrooms. According to Andrew Ramage, Cherwell Laboratories’ Microbiology Product Specialist, it provides the user with clear and concise information to better understand why and how best to decontaminate a cleanroom. “It will be especially useful for inexperienced and trainee operators trying to get to grips with working in that type of environment, and also act as a handy reminder to the basics for more experienced operators,” he said. The guide is available from Cherwell Laboratories. Sometimes, surface disinfecting isn’t enough or would take too long if a large decontamination exercise was needed. In these cases and when the cleanroom is opened after a shut-down or a bioburden outbreak, airborne decontamination is required. A number of systems are available for doing this including fumigation, gaseous methods, spraying and dry fogging. Cherwell recommends the use of dry fogging technology for its speed and lack of condensation related wetting. Ideal for decontaminating small and medium sized cleanrooms with complex layouts, dry fogging systems use cold sterilant chemicals that are delivered into the air space using fogging nozzles at high level in the cleanroom. The vapour disperses rapidly and reaches all areas in even complex cleanrooms, as well as the High Efficiency Particulate Air (HEPA) filters. An enormous advantage of the fogging system is that it avoids wetting any of the surfaces thus avoiding any compatibility issues. It is also fast as a remedial disinfectant technology. The fogging delivery mechanism cannot penetrate layers of dirt so a pre-clean is sometimes necessary if dirt is present on any of the cleanroom surfaces.